I think itâ€™s crazy that there are people out there who donâ€™t believe that dinosaurs ever existed.Â It was like during that Republican debate when the candidates were asked if they believed in a seven day creation and something like four of them raised their hands.Â Fantastic.Â I hear Huckabee would have nominated the Easter Bunny for Secretary of the Interior if heâ€™d have won the election.Â Now thereâ€™s a new DVD collection out about the best dinosaur ever and itâ€™s hard to not believe in this one. 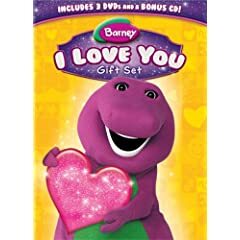 Starting this October 14th, now available as a three disc boxed set from Lionsgate and HIT Entertainment comes the next collection of adventures from everyoneâ€™s favorite purple dinosaur.Â Barney â€“ I Love You Gift Set is ready to romp around your living room and captivate the hearts of everyone around.Â Bring home this wonderful and informational collection today! This boxed set contains three DVDs.Â The first of these is â€œNow I Know My ABCs.â€Â In this disc, Barney, Baby Bob and BJ all learn the importance of the alphabet and we all get to recite them together in fun and interesting ways.Â The second of these is â€œBarney Songs.â€Â On this disc, you will get to sing along with Barney and friends on 24 of their favorite songs of all time.Â 24 songs!Â The third of these buy propecia shampoo discs is â€œLetâ€™s Go To The Zoo.â€Â In this one, we meet all sorts of new animals when we go on an adventure to the zoo.Â This fact filled animal episode is nothing but fun. In addition to the three great discs of dinosaur action, this boxed set also includes the greatest special feature of all â€“ an exclusive music CD, â€œDino Tunes.â€Â Your kids will love these songs and this is the only place to get them. Barney and all his pals have been around for decades and they have deserved the success and cultural status theyâ€™ve been granted.Â If I remember correctly, their PBS broadcasts have formed the nucleus of the Barney empire.Â They donâ€™t have flashy graphics or hip characters, just kind and loving dinosaurs who love to have fun and sing some great songs.Â This show has been instrumental in teaching a whole generation of children the joys of cleaning up, being friends and caring for one another.Â This collection is another step in that same direction of excellence. This three disc boxed set and exclusive Dino-Tunes CD are available at Amazon.com. No user commented in " Movie Review: Barney â€“ I Love You Gift Set "